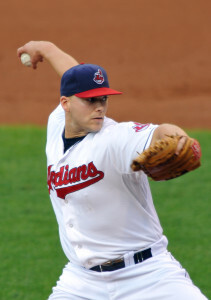 The Cardinals have bolstered their starting rotation depth by acquiring Justin Masterson from the Indians in exchange for top outfield prospect James Ramsey. Both teams have officially announced the deal. Right-hander Michael Wacha has been moved to the 60-day DL to make room on the Cardinals’ 40-man roster. Masterson, 29, is currently on the disabled list (he’s set to be activated this weekend) and in the midst of a down season as he heads into free agency. He’s earning $9.7625MM this season, of which roughly $3.3MM remains. Masterson looked the part of a top-of-the-rotation starter in 2013, posting a 3.45 ERA with 9.1 K/9, 3.5 BB/9 and a 58.5 percent ground-ball rate in 193 innings. He’s battled a knee issue for most of this season, which could very likely have contributed to his 5.51 ERA and bloated walk rate (5.1 BB/9). Masterson’s fastball velocity has declined significantly this season, falling from an average of 91.6 mph in 2013 to 89.1 in 2014. However, Masterson’s now former pitching coach Mickey Callaway said earlier in the month that he felt Masterson’s knee injury had altered his mechanics, which could explain the dip in velocity as well as the increase in walks. The Cardinals have been on the lookout for rotation help for weeks now, having also been connected to Jake Peavy as well as aces David Price and Jon Lester. Masterson comes with upside, to be sure; FIP, xFIP and SIERA all feel his skill-set should have resulted in an ERA in the low 4.00s this season, and he’s had a good deal of past success. However, his injury and ineffective results will leave some Cardinals fans wondering if he’s truly an upgrade over internal options. That remains to be seen, but the Cardinals felt that Masterson could bolster their starting pitching in light of Michael Wacha’s injury and the struggles of Shelby Miller. While Adam Wainwright and Lance Lynn are reliable arms atop the rotation, Joe Kelly has been injured for most of the season, and Carlos Martinez would shatter last season’s innings total were he to remain in the rotation over the final two months (to say nothing of the postseason). As for the Indians, they’ll receive Ramsey, a 2012 first-round pick that ranked seventh among Cardinals prospects on Baseball America’s midseason list and ranked sixth according to Jim Callis and Jonathan Mayo of MLB.com. The 24-year-old is hitting .300/.389/.527 with 13 homers in 281 Double-A plate appearances this season. Callis and Mayo note that Ramsey has the speed to play center field (though he’s not a huge threat on the bases) and the arm to play right field if a change is needed. He draws a fair amount of walks and has shown more power than some anticipated coming out of college, the MLB.com duo adds. Peter Gammons first reported that Masterson was headed to St. Louis (on Twitter), and Joel Sherman of the New York Post was the first to report Ramsey’s involvement in the trade (Twitter link). Shocked they didn’t go for one of the aces. Step 1: Acquire Justin Masterson. I hope this isn’t their big move. I hope so too. If they’re getting another pitcher, with this deal, it looks like one of the starters is on his way out, Miller perhaps? With Wacha back, bringing in another pitcher after Masterson, would mean Waino, Wacha, Lynn, Masterson, and Miller, add another starter and one of those guys has to go. Miller more than likely. Lynn’s pitched great this year, but hasn’t gotten run support lately. Masterson likely moves to the bullpen when Wacha comes back. That leaves a rotation of Wainwright, Lynn, Wacha, Kelly, and Miller, which is already one of the best rotations in the National League. There’s no need to sell the farm to make it even better than that. And here we go. Not going to get much work done in the next 25 hours or so. Was really hoping if the Rays traded Price to anybody, it would be the Cards, oh well. Doubtful now. What do you mean? Masterson is an innings eater. He’ll help the bullpen get more rest without adjusting how much the other starters pitch. Here lately, the innings have been eating him, then burping in the 5th. That’s still no worse than Martinez. Does this trade make the Pirates better? Hard to complain when they’ve won two WS in his tenure. One, actually. Walt Jocketty was the GM for the ’06 title run. Maybe he meant two WS appearances. I mean, people scrutinized Mo when he made that trade with Toronto and it propelled them to a WS title in 11. Agreed. That was a hard trade at the time, too. Looking at Masterson’s numbers on B-R, I’m underwhelmed. Holding out hope they pull the trigger on Price, but I’m not holding my breath. I’d be fine with Price, or Hamels. I’m not keen on Lester due to him wanting to be back in Boston after this season. Hamels is under contract until after the 2018 season so he’d make more sense. And the way the Rays are playing, I doubt Price gets dealt. Your logic makes a lot of sense. Hamels would be a fine pickup, assuming StL would be okay with the payroll (assuming yes). Philly is presumably out of it, and it doesn’t make much sense for TB to wave the white flag with as hot as they’ve been. Didn’t think of the Lester returning to BOS after the season, that’s a good point. Was it hard? People fall in love with bad prospects way too much and it was clear to anyone really paying attention that Colby Rasmus needed to check his attitude and get humble. He wasn’t willing to do it in St. Louis, he still seems rather unable to really put it all together in Toronto. I was glad to see him go. Same as I’ll be happy to see Carlos Martinez hit the door since his attitude looks to be fairly poor and doesn’t match up to his performance. He’s running on hype at this point and I’d be thrilled to send him along for a world series appearance. At the time it was. I don’t remember StL having the depth in OF at the time of that trade. The return was head scratching at the time, but nobody will argue with the end result and the impact those guys had (Scrabble, E. Jackson). I recall Rasmus and TLR weren’t big fans of one another and that probably made it easier to move him on. Regardless of personal feelings for a player, (right or wrong) I recall having similar feelings for that trade as I do the Masterson trade. It’s certainly easy to play arm chair QB during trade deadline. I’ve watched him pitch, but I’ve also watched his attitude and he looks like a guy who doesn’t want to be coached. So those other things he needs to learn, maybe he’s not so interested in learning them. Until he does, he’s got a lot of hype but no production. I’d let someone else take the risk that he’s gonna mature properly and get back a known quantity and an invested professional instead. One Thanks to Nelson Cruz misplay in RF, but if they had the guts to make Impact moves they could have 3 of them. Of course a move that wasn’t rumored is the first shoe to drop. Hey, remember 2011? that move they made with Toronto helped them to a WS title? I hope this isn’t their only move, but Mo has made weird moves that has worked out for them. Hmmm, I look at Masterson as a guy that’s not really going to help much this year, but if he can rework his mechanics he could come back strong in ’15. Cards are buying low, it could pay back longer-term. Isnt he a free agent at the end of the year? I thought the Cards would be in on Lester or Price. Also, am I wrong in my opinion that the Cards also need an impact bat? Seems like their offense could still use some help. What do you mean? Jay has been doing a great job in CF. Sure he doesn’t have much power, but you don’t need it everywhere. RF is where the problem is, yet it’s also not likely that you’d push both Craig and Taveras to the bench for the rest of the season. If he doesn’t pick it up soon, I expect to see Craig get benched against all right handed pitchers (and maybe even some lefties) and give Taveras a real shot at the job. Pretty meh move. But better than watching Taveras and/or Martinez in a different uniform for the next 7 years. You know, I love Martinez, but I think he has a bit of an attitude problem. It seems like he’s hard to coach. That could just be me though. I’d be okay seeing him in another uniform, but Taveras I wouldn’t be. I bet this is just a precusor to another trade. With a starter, probbaly Miller, on his way out. I think those guys are a little more than overrated at this point after giving both of them a solid shot at proving they’re ML ready. It’s honestly best to trade them now before any more ML time shows that they may be career AAA superstars but duds at the major league level. I’d be totally willing to be wrong about that after what I’ve seen so far and max returns rather than cling to hopes and dreams. Could be like Mike Hessman from the Tiger. Stud in AAA, awful in the majors. Not stoked, but not mad. I dunno. I guess this says that the price for Price (ugh) was way too high to deal with? That or they’ve got a pretty solid lead on a top notch bat to make the offense not terrible, I dunno. What if this is a trade chip for Hamels. Taveras, Shelbey Miller and Masterson for Hamels? That could work. Why would the Phillies want Masterson when he’s a FA in 2 months and can’t be given a QO? Good point but its a buy low and hope he turns it around. Doubt it. What would be the point of getting Masterson when they could have just given up Ramsey to Philly? And I also don’t see why Philly would want Masterson. This move just doesn’t make sense for the cards needs. why would the Phis want a guy who will become a free agent? Maybe they picked him up as a 5th starter and still get Hamels and move miller. That’s what I’m thinking. Miller has been good, but he walks way too many. Or, maybe they get rid of Martinez and keep Miller but put him in the pen for the rest of the year. Lynn pitched really well out of the pen a few years back. I just hope this isn’t their only move. That makes sense. I can still see a Taveras, miller/Martinez for Hamels. They didn’t give up anything for Masterson. Ramsey is going to be a good player, but he was blocked in the majors at the OF spots, so maybe him going to Cleveland can help him get to the majors quicker. The Cards didn’t want to get someone unless they committed long term. Does Masterson commit long term to the Cards after this season? Probably should start pitching good first before they even think about that. Does anyone know if masterson is a free agent at the end of the year? Well last year Masterson had a 3.35 FIP in the AL and so far this year his FIP is 4.08 and the Indians were the worst fielding team in baseball for a while with Santana at 3B and Swisher at 1B. Could be a solid bounce back candidate that has been getting unlucky due to bad D.
Also, Cards are stacked with OF prospects so Ramsey is expendable. As a Brewer fan, love seeing the Cards disposing of one of their prospects for this return. I suppose the thinking is with Masterson pitching and AJ catching, umpires will suddenly start giving borderline pitches he wasn’t getting in Cleveland where his walk rate was very high. NOOOO I wanted the Cards to be in on Lester. I guess they could still be interested but hard to see. They could still land Lester. Masterson can pitch out of the bullpen, and the Cardinals certainly didn’t drain their system acquiring him. True just have a hard time seeing them give up a top 10 organizational guy for Masterson for a half a year to put him in the pen and then trade a Piscotty type package for Lester. I was thinking just in the bullpen for the end of 2014 and the playoffs. Back to starting in 2015 if he re-signs? He’s struggling as a starter right now (albeit with dreadful defense). Well Ramsey is blocked in the OF at the major league level anyways. With Craig, Holliday, Taveras and Piscotty. When you’ve got huge depth like that, you can afford to get rid of him and possibly overpay, especially when he wouldn’t be in the majors for probably another 3 years or more. …along with Jay, Bourjos, and Grichuk. I like how you call it a “Piscotty” type package. If we acquire one of the big fish out there (Lester, Hamels, Price), and Piscotty is in the trade, he’ll be the 2nd guy in the package. Don’t expect to get any of the three unless Taveras, Martinez, or Shelby Miller is the headliner. Ramsey would be a massive overpay for Masterson if he moves to the pen. Could have gotten a true reliever for that. Acquiring Lester would make Pitt the clear cut favorites in the NL Central now, but will they hold firm on not dealing any of their top 5 prospects? This deal might get them to consider it. Masterson isn’t a huge upgrade for the Cards, but it increases the separation between them and Pitt. They cannot and won’t ever get him without dealing at least one of the top 5-6, probably more like 2. Masterson has been dreadful this year and got the Tribe a top 5-6 prospect in a strong system. The Pirates would be dumb to hang onto their OF-prospects for too long, Their MLB-OF is crowded. Ramsey would’ve interested the Red Sox imo. Taveras and Ramsey for Lester. I’m a Red Sox fan and there is no way Lester is worth Taveras let alone Taveras plus more! This deal very well may have driven up the cost for the Pirates to get Lester substanially. Mo may have just made it necessary for us to give up two in our top 10 for Lester by getting Masterson with a solid AA OF. Could’ve hamstrung my Pirates by helping his Cards. Josh Bell plus guys in your top 20 should work because Bell is a higher prospect then Ramsay and this seems like a bit of an overpay. It’s not an overpay, but most in here don’t get it. It would be an overpay if it rarely happened, but it occurs every off-season and deadline. The Sox got a similar package for Peavy, who has been one of the worst regular SPs this year. If the Pirates want him, it needs to be for 2 of their top 6. No way Pirates do two of top 6. Their Top 6 is Glasnow (20 on MLB midseason top 100) Tailion (ace and number 32) Bell (#33) Meadows (Top ten pick and #50) Kingham (#66), and Hanson (SS of future and #80). Ramsay, Escobar, and Hembree weren’t even on the top 100. And their #7 is McGuire who is also in the top 100. And another outfielder we have Harold Ramirez just missed out on the top 100. He was in the top 101-105. 2 top 6 seems a tad too steep. I think Bell, JaCoby Jones and a low minors, high upside arm like Clay Holmes would get it done. Lester, Miller, Carp/Gomes + cash for Bell, Kingham and Jones? We can dream right? Imagine how much more he would’ve cost if he were traded over this last offseason coming off a 3.4 bWAR season as a 28 year old starter. Price is steep for pitching, even for 2 months of a mid/back rotation arm. Makes me wonder why the Brewers are holding on to Marco Estrada? Even he’s been better than Masterson this year. Marginally better. Though Estrada is giving up a ton of HR. You gotta think the bidding for Lester is probably down to mainly Pirates and Dodgers. Pirates may feel inclined to make a move to keep up with Cardinals after making this deal. What exactly would the A’s have to offer for Lester? I’ve seen them listed as “in” on Lester, but I don’t know what they have left to offer, especially what could compete with other teams offers. Millone is a very servicable starter with MLB success. Would be a solid starting point. Probably offer Samardzija in return. IMO Matthew Olson would interest Boston a lot, and I haven’t seen him listed as untouchable anywhere (Like Robertson & Nunez). Dillon Overton and Seth Streich are intriguing, too. Mariners will trade for Lester and sign him for 22 mill/year for 10 years. And the fun finally begins. Not sure this is enough for the Cards. Masterson will be ok in St Louis do to the pitching coaches alone. Re-bound. Velocity declines of the magnitude he’s experienced are usually not fixable. This is a sizable gamble by the Cards, I’d say. Maybe they have so many good OF prospects they don’t care. from what’s being written, the Indians seemed to think a lot of the problems were based on mechanics changes that were caused by his knee injury. That’s the most comforting thing about this for the Cardinals. I’m still going to be upset if this is *the* move for the Cardinals though. The Cards love a bargain. Exactly. I can still see a trade for Hamels. Taveras, Miller/ Martinez for Hamels. This gives them their 5th starter. I think Mo went with Masterson because he’s cheap. Now we may expect Miller or even Kelly to be dealt. With Wacha coming back yhou’d have Wainwright, Wacha, Lynn and Masterson for sure, maybe deal Miller and move Kelly to the BP or deal Kelly and move Miller to the BP. Right now if I had to guess, I’d think Miller would be dealt for an ace, and Kelly moved to the BP at least after Wacha comes back. I agree. This makes miller expendable in trade. surprising and disappointing move with all the big name pitchers floating around out there. I am thinking that Cleveland got the better of this deal. Maybe there is still a bigger deal in play – if Cards trade a Miller or Martinez as part of a deal for an ace, they still needed a fifth starter to take the place of Miller/Martinez. Exactly. It just smells like another deal, especially since they never were really in on Masterson. Agreed. I still think Hamels is in play for the cards. This makes miller or Martinez expendable in trade. Not gonna lie, this is so… Not the Cardinals. Signing A.J. Pierzynski and trading a #6 prospect for an inconsistent Masterson, who’s also on the DL?!? I expect something like this from the Yankees, not the Cards. I mean, #6 in a system really isn’t all that high. If you put all farm systems on the same level, there would be 150 players ahead of him. Obviously that isn’t very accurate, but you get the point. Figure in the quality of the Cards system (esp in the OF) and you’re easily talking a top 100 kind of guy. Masterson’s a rental who has been awful this year, and the Cards actually have a little SP depth, especially when Wacha comes back. Pretty strange deal for a team that usually makes good ones. …Except he isn’t a top 100 kind of guy. Solid prospect, sure, but including their major league roster the Cards have at least a half dozen OFers with higher ceilings. How many quality OFers the Cards have is irrelevant to how good Ramsay is … just sayin’. Point isn’t that Ramsay was ticketed for Busch, it’s that they could have gotten more then a broken-down rental for him. Whose to say he’s broken down? Or a rental? He’s coming back to pitch for the Cards on Saturday (I’ll be at that game, heh!) and the Cards could easily sign him for next year. Having Masterson as a No. 4 behind Wainwright, Wacha and Lynn isn’t too shabby. I think you’re over-inflating Ramsey’s talents and deflating the pros Masterson can bring to the Cards for the rest of ’14 and 2015 and beyond. Sure. You mean to the Cards? Doubt it. Don’t think they’d give up two of their young cheap OF supply at the same time, and Rox aren’t doing that deal without Taveras. This is off the top of my head, but if the birds sent Craig & Miller with lower-level prospects in a package, could that net Tulo? Craig is horrible this year but would benefit from a change and Coors, that would free up future payroll, and allow for OT to get some time in RF. The only way the Cards would ever get Tulo is if we sent some payroll to Colorado. Another Jake Westbrook? Could’ve done worse. The Cards get Masterson. One less team for the Red Sox to deal with. Masterson is exactly the same as Lester… only completely different. wow…I guess the cost for Lester or Price was way too steep, but Justin Masterson and his non-existent fastball? good luck with that. Bartolo Colon would’ve been better than Masterson. Also, both Rays and Sox probably wanted Tavares in that deal.. He is definitely better this year. Good comparison. Seems to me that this trade is similar to the one a few years ago that sent Jake Westrbook to the Cardinals from the Indians. Good clubhouse guy, great potential as the No. 3 as long as he is healthy, and a guy that can shoulder innings down the stretch. Ramsey is a good prospect closer to major league ready than what the Indians currently have in their system. As an Indians’ fan I am sad to see Masterson go knowing how good he can be, but I am excited to see how Ramsey turns out for the Indians. Truthfully, if the Cards weren’t in such desperation for an innings eating SP and had they not had Taveras, Piscotty and Grichuk already above him, it’s likely they would not have been so willing to part with Ramsey. But the Cards could trade from a position of strength, and they did. I think your Indians got a future starting RF with this trade today. I absolutely agree. Watched Ramsey play last year while in High-A and really like his game. Hoping he is ready by September so we may see less of David Murphy/Ryan Raburn. Boy, how wrong was I with THIS!!!! Just for the sake of argument, the Indians have been rumored at various points to be interested in Lester themselves. Assuming they were really close to acquiring him, what would they need to do first? Clear a spot in their rotation and offload some salary to make room for Lester, right? Hmmm. Just sayin’ is all. Probably offer one of their current starters to Boston..
For a rental? No way in heaven the Indians are trading their #1 prospect for Lester! That is irrelevant. No buyers, no sellers. NOOO way is Lester worth Lindor. Maybe Frazier and that would make sense if they are thinking about it that they would get Ramsay to replace him in the system somewhat. Not much time for the Red Sox to listen. It is time for the Red Sox to pull the trigger. Wouldn’t it be wiser to just try to sign him in the off season if they like Lester that much? I’m not arguing pro or con on the Indians and dealing for Lester. I’m just noting that trading Masterson could be a preparatory step for such a thing. Fair enough. Anything is possible, I guess. I’m just pointing out how illogical that scenario is. And since these front offices are pretty smart, illogical being synonymous with improbable. I love this move. Masterson is an innings eater. That’s what this rotation needs until Wacha comes back. Shelby has been averaging 4.2 innings his last 10 starts and Carlos Martinez is nearing his innings limit from last year already, and it’s not even Aug. 1. So the Cardinals needed someone like Masterson to eat innings in the back-end of the rotation. Does this mean the Cards are through? Of course not. They could still nab a Hamels or Lester or go high for Price. But Masterson *does* help the Cards this year, and could be a great No. 3 if he re-signs (which I’d assume he would do) next year. And while Ramsey is a top-chip talent and may seem high for an injured, soon-to-be-free agent like Masterson, consider this: Baseball is a chess move. Lester has been linked to both the Pirates and Brewers, both in-league competitors of the Cards. By dealing Ramsey for Masterson – a highly-touted talent though roadblocked by all the other good outfielders in the Cardinal’s system – it now ups the potential asking price by Boston for Lester, perhaps making such a trade too expensive for the Pirates and Brewers. So, it’s possibly a strategic move by Mo. I’d wait until you see Masterson throw first. You may have 3 or 4 guys in AAA that would have been better choices to eat innings. He’s throwing meat balls up there most days. Very good point. And I assume you’re an Indians fan or AL Central fan, so you know what you’re talking about. Either this means the Cards aren’t done or man, the asking price for Price or Hamels or Lester were astronomical. Of course it would’ve. Throw in some underperforming player and you can probably get someone like Bartolo Colon, Tommy Milone, etc.. Doubt it. Indians started actively shopping Masterson recently. He’s a FA at the end of the year, but Kennedy is controllable beyond this year and has pitched well for the Pads. If they don’t trade him, it’s not a big deal. So they’ll likely hold onto them unless they get blown away. So, you think Kennedy is worth more than Masterson? I definitely think he is more valuable to teams inquiring about a SP. Masterson hasn’t been as bad as is his numbers would lead one to believe, but his control and lack of velocity are worrying. If you don’t think this season is the the true Masterson, you could make an argument that he might be a slightly better pitcher than Kennedy. However, Kennedy has 1.5 years of control left, while Masterson is set to be a FA and coming off of an injury. Right now, given the much better recent performance and extra year of control and Kennedy has significantly higher value. but good value for masty. no complaints. Okay Pirates, your move is next. You Brewers fans, your team don’t have a chance. I’d say having Braun and Gomez in the same outfield gives them a fairly good chance every time the lineup turns over. Something about this doesn’t sit right. His periphs say his ERA should be in the low 4.00 area which is fine I suppose for a number 4 or 5 guy but Ramsey isn’t worth giving up for that. I believe like others that three is a bigger deal in play. I would assume it is for one of the aces available. Perhaps Hamels. Um no… Yankees would hang up quick on that one. Not gonna diminish Lester’s value at all. Masterson has been awful this year and Lester has been dynamite. It’s still gonna cost a top 50 and 1 or 2 more good prospects to get him. The Red Sox don’t have to deal him. They’re fully capable of resigning him or making him a QO. They’d get nothing, except having a front of the rotation arm in Jon Lester. Teams don’t just give away front of the rotation arms, even if he’s a 2-month rental. It’s gonna be a pricey acquisition and if the Pirates aren’t willing to give up 2-3 prospects from their stacked system to significantly improve their chances at winning a WS this year, then they’ve got no one but themselves to blame if they don’t win that WS. I’m not saying it’ll cost Glasnow, Bell and Hanson, because that’s an unreasonable ask. But if they’re not willing to part with Nick Kingham and one of their many OF prospects (Bell, Meadows, Ramirez or Jones) to get an ace for the next 2 months and possible WS run, that’s a bit foolish IMO. Especially given the depth of their system and how their big league OF looks for the foreseeable future. STL gave up a lot in Ramsey, especially for a pitcher who will be a free agent. He’s also a groundball pitcher moving to a much better defensive team in the NL. That’s giving up a fair amount for pitcher with a 6.06 era in 19 starts..
Masterson will deal in St. Louis. They always get good production from starting picthers who struggle elsewhere. Hell, they made Jake Westbrook look like a Cy Young candidate at times. Doesn’t make much sense for the Cards. Maybe this is a precursor to Price, Lester or even Hamels with Miller heading out the door. If not, then it’s just blah in my opinion. Didn’t see that coming. Good move for Masterson as he’s headed to a playoff caliber team with a chance to rebuild his value as he heads to free agency. He should be able to eat innings for the Cardinals and who knows, could just turn out to pitch very well. Gave up what’s considered to be a decent prospect but the Cards are great at evaluating talent so maybe Ramsey has some holes in his game. It’s more that fact that the Cardinals are loaded with promising outfielders in both the Majors and Minors than anything against Ramsey. This move reminds me of the Colby Rasmus for Edwin Jackson, Octavio Dotel, and Mark Rzepczynski trade a few years back. Gave up what seemed to be too much in a promising OF like Rasmus, but in the end, they won the World Series that year in large part thanks to the contributions from all three. Masterson, if he finds his form (which St. Louis has a talent for doing), could have a bigger impact than all three. It looks like a pretty good trade to me. Masterson is now healthy, moves to a much better defense in the NL, a few mechanical tweaks to help him out, and he helps eat up innings until Wacha gets back. In return, we only gave up a good yet still one of our lesser outfield prospects in a franchise full of promising outfielders. There was never any need to sell the farm for a front-line starter, and I doubt Mozeliak was ever seriously considering getting someone like Price or Lester. Once Wacha comes back, I’d put the rotation of Wainwright, Lynn, Wacha, Kelly, and Miller right up there with the Dodgers and Brewers in the top tier of NL starting rotations. Tribe got a nice deal for Masterson.